Bookstore owners, you may need to update the dictionaries you're selling. I looked up the word, "kazoo," and the definition said it's a musical toy that produces a buzzing sound when you hum into it. Hmm. Sadly, this definition is incomplete. It regrettably fails to mention a perfectly superb bookstore located in a bookstore town in a bookstore state. So you see, the definition needs to include a mention and definition of Kazoo Books. Since you won't find the definition in a dictionary, continue reading for the full explanation! Gloria T., the owner, told me her late husband came up with the store's name, a contraction of the town's name. That was 30 years ago when Gloria and her husband began the business as a used book store. Today's store is a far cry from its original form. When I asked Gloria what their secret for success and longevity is, she said change, adapt, and evolve. This, along with the store's commitment to customer service, are the hallmarks of successful, long-running bookstores. Additionally, the store does multiple events in-house and off-site. They also host book clubs and writing clubs in the Annex, next door to the main building. These are all great ways to get the store's name out there. As Gloria said, even after 30 years they conintue to see new local customers in the store. 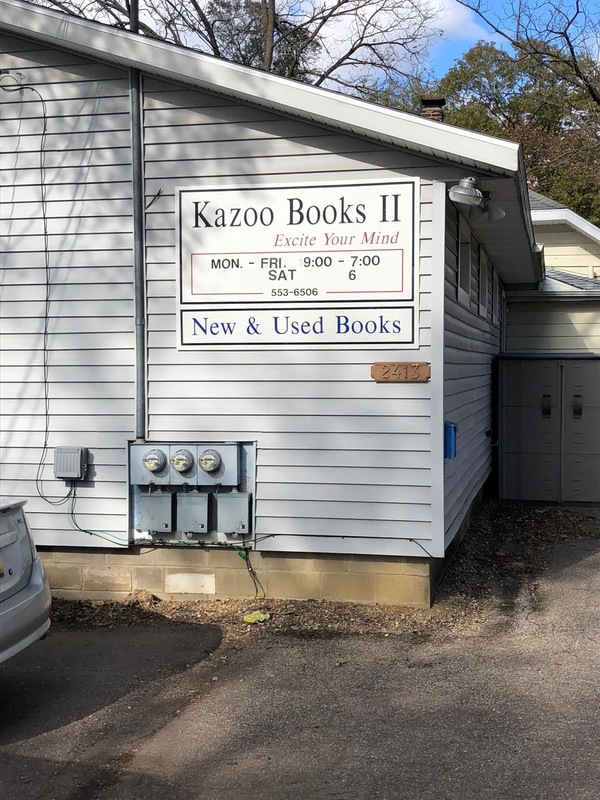 Kazoo Books offers new and used books, now selling more new than used. This inventory is shelved into two buildings with multiple rooms and levels. They don't have many sidelines but they do offer candles, some inspirational cards, and have recently started selling chocolate. They have been offering books for purchase online, including collectibles, since 1997, very impressive. Everything is quite neatly arranged and organized and the cherry on top is the resident cat who lives here, Radio. I think there are some customers who probably come to the store just to see Radio! Gloria and her staff were absolutely wonderful to meet and visit with. John (sci-fi fans need to meet and visit with him), Todd (writes the store's newsletter), and Joslyn (thanks for the photo shoot!) are all people that would be valuable to ANY bookstore owner. There you have it. The true definition of kazoo, as in Kazoo Books. Now that's music to my ears! Go to an indie and buy a book. Bonsoir. CURRENTLY READING: Seven Days Of Us, Francesca Hornak. RECENTLY PURCHASED: The Diary Of A Bookseller, Shaun Bythell. There are two buildings, both with two entrances. This is the lower level entrance to the Annex building. You can also enter from above. Regular customers probably will enter just past this sign and on the left. I would strongly encourage using this parking lot behind the store rather than trying to park on the very busy street in front. View of the regular entrance to the store, up the ramp and to the left. Out of the picture to the right is the Annex. After you walk up the ramp, this is the view of the front room of the store. You'll find a display of sidelines just inside the entrance. Display of new and notable books in the front of the store. Looking toward the right on the main level front of the store. View into the back room of the main level. Gloria hopes these chocolates are as big a hit with the customers as they are with the staff! This is the upper level entrance to the Annex, straight across from the main store entrance. View looking into the Annex and a great space for book clubs and writing clubs. I know some book clubs that would accept this challenge! View looking to the right from Annex entrance. Partial view of the children's section in the Annex. If you like comic books, you need to visit here. I entered the bookstore on the street level, a lower entrance. This is my view looking in and to the left. The main part of the store is the level above this one. View looking to the right from the street level entrance. When I saw this sign, it became clear to me. A great place to sample a book. Overview of the lower level. Take the stairs up to the main level and browse the books on the way. L-R Gloria, yours truly, John, and Todd. Just three of the fine folks you'll meet at Kazoo Books. Thanks for a great visit. I know some of you who follow this blog aspire to be bookstore owners and thanks to Eddy N., the owner at Driftless Books & Music, I've found the perfect recipe for starting your own used book store. Scour the internet for someone selling books, perhaps on eBay. Try to buy two semi-truck loads. TA-DA! You now have a used book store. At least, that's how it all began for Eddy and Driftless Books. And now after 15 years in business it has evolved into three floors of books numbering around half a million (Eddy guessed at this but honestly I'd say at least a million). To my surprise, on this week day afternoon in a small town of approximately 6000, this store has what all bookstores hope for, a steady stream of business. To call this a bookstore is only part of the story. The broader description would be museum. My guess is regular customers see something new on every visit. Art work of several genres, antiques, lots of beer cans, posters, memorabilia, and nostalgia of all kinds. In addition to local customers, the store sees many tourists as well as regular visitors from Chicago who have second homes in the area or visit Viroqua as a vacation destination. If these customers bring books into the store, they can receive store credit or cash for larger collections. With the overwhelming inventory, there isn't a data base but you can find books of special interest available online. The store has a great event space and has hosted as many as 80-100 live music events a year. These have become so popular that they've had to hold back from adding more to the schedule. The store is closed during the winter months but if you want to visit, give them a call and you'll be able to go. During all the other seasons, this is an absolute destination and must-see. This bookstore/museum is beyond hip in a historic building with creaking wooden floors blending their sound with the very cool jazz playing on the day of my visit. Eddy and Al, one of the staffers, were a blast to talk to and their stories are just as fascinating as the bookstore itself. So, put this one on your list, readers. A hip bookstore in a perfectly charming upper midwestern town will have you reluctant to leave. Go to an indie and buy a book. Bonsoir. JUST FINISHED: The Haunting Of Hill House, Shirley Jackson. Some of you might be more familiar with this author's renowned short story, The Lottery. This is one of her novels about a group of four people who visit a haunted house to investigate paranormal activity. I didn't find it scary as much as it was just plain weird. If you're expecting it to be like the Netflix series, you will be disappointed. The only thing the two have in common is the house, that's it. RECENTLY PURCHASED: Selected Stories, Alice Munro. Not purchased but gifted, Wisconsin Roots Music Cooperative, a music CD featuring various artists. Thanks Eddy. A profile of the building which gives you an idea of how big it is. All three floors are full of inventory. An impressive mural on the outside of the building. The building was built in 1906 and as you see, was home to a tobacco company. Sign above the entrance. And I did get lost up on the 2nd floor. View looking into the store. This is an entryway room. Art work of many genres can be found throughout. Continuing into a second entry room. You'll find some of the music on vinyl here as well as recently added books. Entering into a third room, each successively bigger. Beer can collectors will enjoy visiting here. There is an impressive collection throughout the store. Some great places to sit and sample books here in the 3rd room. More of the terrific art work displayed. View looking into the massive 4th room on the main floor. This is where the main book action begins. Some of the CDs available. The length of bookshelves in the large main room is impressive. You'll find lots of books of local and regional interest, these are just a few. Retired instruments. Believe it or not, school band directors are using instruments in worse shape than these! This is the performance area for music events. The store has a great space for this. Overview of the large main room looking back toward the front. I think this reader has aged. A partial view of the children's area. Looking into the 2nd floor. The 2nd floor. The thing I like about areas like this is it's like going on a treasure hunt. You never know what you're going to find. You can't get this experience online. More of the 2nd floor. There are multiple rooms on this floor, and for a first time visitor, you can get turned around! If you're been looking for the Document Catalog of the 74th Congress, 1935-36, you can find it here on the 2nd floor. A long wall of book shelves on the 2nd floor. Found this on the 2nd floor as I rounded a corner. It freaked me out. View looking into the basement of books. The basement wall of bookshelves. With Eddy on the left, the fine owner at Driftless Books & Music. Thanks for a great visit.